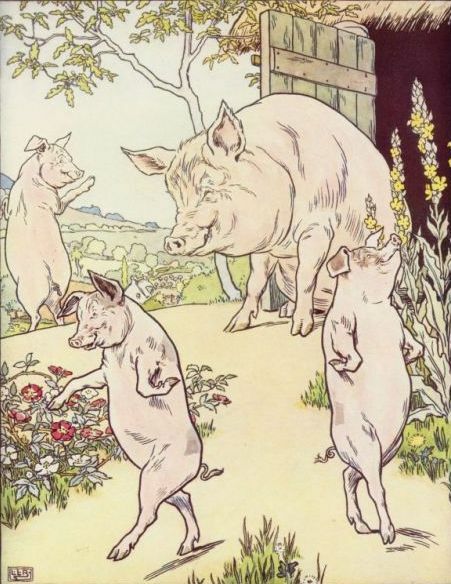 The story of The Three Little Pigs featured here has been adapted from different sources and from childhood memory. The primary sources are English Fairy Tales , retold by Flora Annie Steel (1922) with illustrations by L. Leslie Brooke from the 1904 version. This story is featured in our Favorite Fairy Tales and Children's Stories. 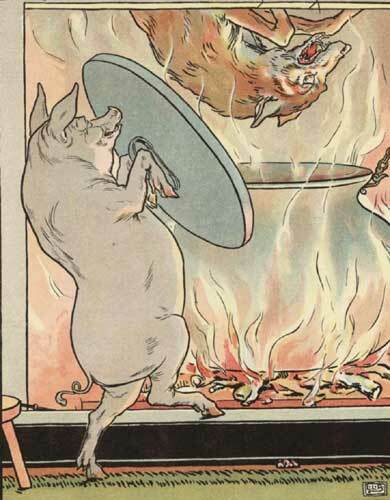 The first little pig was very lazy. He didn't want to work at all and he built his house out of straw. 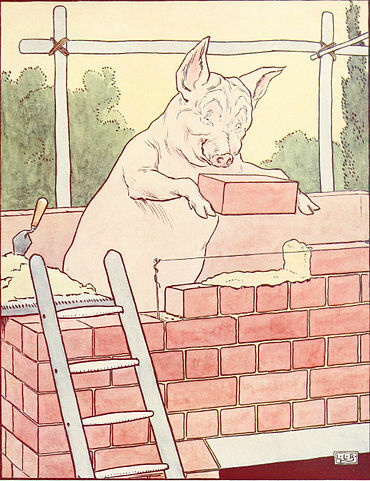 The second little pig worked a little bit harder but he was somewhat lazy too and he built his house out of sticks. Then, they sang and danced and played together the rest of the day. The wolf chased them down the lane and he almost caught them. But they made it to the brick house and slammed the door closed before the wolf could catch them. The three little pigs they were very frightened, they knew the wolf wanted to eat them. And that was very, very true. 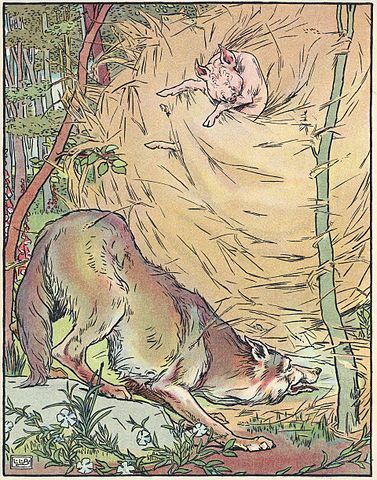 The wolf hadn't eaten all day and he had worked up a large appetite chasing the pigs around and now he could smell all three of them inside and he knew that the three little pigs would make a lovely feast. Well! he huffed and he puffed. He puffed and he huffed. And he huffed, huffed, and he puffed, puffed; but he could not blow the house down. At last, he was so out of breath that he couldn't huff and he couldn't puff anymore. So he stopped to rest and thought a bit. If you enjoyed this story, you may be interested in our collection of Children's Stories or other titles from our library of Pre-K Read-Aloud Stories.